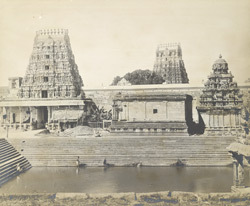 Photograph of the tank in the Ekambreswaraswami Temple at Kanchipuram , from the Archaeological Survey of India Collections:Madras, 1896-98. This is the largest and most important Shaiva temple of Kanchipuram which dates mostly from the 16th-17th centuries. It is entered through a very tall pyramidal gateway or gopura almost 60 metres high, erected in 1509 by the Vijayanagara king Krishna deva Raya and covered with sculptural ornamentation. Two smaller gopuras on the south and west lead into the inner enclosure. Here is the "thousand pillared hall" with elaborately carved columns. The hall faces a tank with stepped sides in the north. The small pavilion in the middle of the tank symbolises the centre of the universe surrounded by the primordial waters.